It happens only seldomly that a company produces a high-quality software application and gives it away for free. This, however, did happen at Sennheiser , the renowned manufacturer of high-quality microphones. They took a WAHAN acryl drum set with Sabian cymbals and hi-hat and recorded it in a professional studio environment with Sennheiser ‘s and Neumann ’s range of high-end drum microphones. They then programmed a free virtual drum kit for Native Instruments’ Kontakt 5 Player, called it “DrumMic’a!”, and made it available to everyone . I believe the answer is that they want to promote their own and Neumann’s high-end microphones. Their method is to give every recording and mixing enthusiast on the planet a chance to listen to and understand the coloration that their microphones bring to a drum kit recording. It’s unlikely that the average music hobbyist can or wants to afford all the Sennheiser and Neumann microphones that were used for the production of DrumMic’a!. Still, having the chance to test each one by the click of a button, on one and the same drum kit, offers great learning opportunities for anyone interested in audio engineering and (finger) drumming. The free virtual drum kit DrumMic’a! seems to be integral part of a well thought through marketing campaign that might pay off in the long run, when some hobbyists will become professionals. However, DrumMic’a! isn’t just a free virtual drum kit for audio analysts. It has been produced in a way that it is a lot of fun playing finger drumming on it. More than 30 presets have been created for different styles of music, so that it eventually is a universal free virtual drum kit for any musical project. The GUI of DrumMic’a! has been kept very clean. 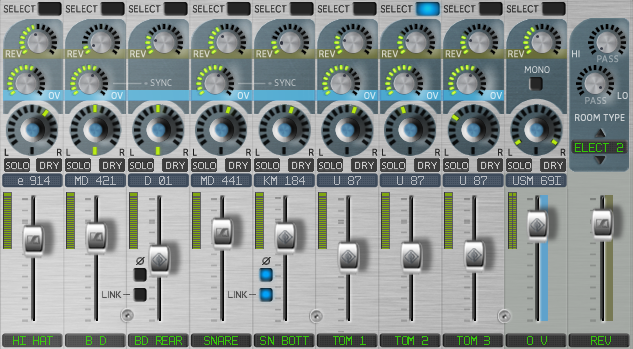 When the plug-in is opened in the Kontakt 5 Player it only displays the clean transparent drum set on a white background. Next to the acryl drum kit itself, the microphones currently selected for this setup are visible as well. They are placed next to the drum kit pieces that they are meant to record. Clicking on one opens the “Mic Selection” menu. There, one can change the microphone to be used for that particular position. Each microphone comes with a description of how it colors the sound, which makes it easier to choose. Clicking on one of the available microphones of that position lets the plug-in revert back to the main drum kit view. In order to get acquainted with DrumMic’a! I suggest playing a bit with the factory presets that this free virtual drum kit comes with. The styles covered by the presets are pop, rock, blues, metal, jazz, drum’n’bass, plus brit pop, disco, funk, hip hop, trip hop, reggae, rhythm’n’blues, and experimental mixer settings. Having gone through all of these presets, I can say that they offer a lot of diverse sound settings that make this free virtual drum kit an outstanding sound source for finger drumming. Another feature that I really like is that one can change the perspective of the mix between “audience” and “drummer” perspective. The effect of this perspective change can best be tested with headphones on. In particular, the drummer perspective for playing finger drumming with DrumMic’a! is a great experience. The mixer of DrumMic’a! offers many standard and advanced features. Next to the classic volume, panning, and soloing features, it offers channel linking for the snare and kick drum. This means that the balance between the snare top and bottom microphone, as well as the balance between kick drum front and rear microphone can be adjusted, and once “linked”, fader movements will happen “in parallel” so that the linked microphone balance doesn’t change anymore, no matter which volume is later set for the snare and kick drum. Furthermore, the overhead microphone stereo width as well as the overhead microphone level of each kit piece can be adjusted. That’s great when mixing “space” into the drum kit sound. They have also made a reverb effect available to further shape space. Via the “select” buttons on the top of each channel, the dynamics section of a selected channel appears in the top right corner of the GUI. The parameters of three different dynamics modules can then be changed. With all these options to shape sound, a person can get pretty far in creating tailored mixer presets for desired drum kit sounds. DrumMic’a! also lets one choose the velocity curve in the “options” area. This is helpful if one wants to play different styles of music that require an overall velocity setting, like rather calm finger drumming for jazz, and rather intense finger drumming for metal. With the velocity curves one can choose from, there is full flexibility. Per default, there is one linear, one exponential (degressive), and one logarithmic (progressive) curve available, but it is also possible to just draw a custom velocity curve in the editor window. Nice! This is a very important point when it comes to finger drumming. 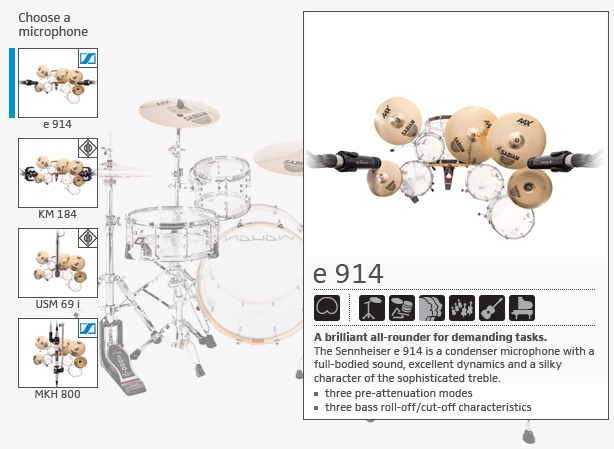 Although DrumMic’a is a free virtual drum kit, Sennheiser have gone that extra mile to make the MIDI mapping flexible and thus increase usability. The MIDI mapping section can be accessed via the “options” menu. There, the most important MIDI mappings can be chosen by the click of a button. The General MIDI mapping will work with most applications, such as the XpressPads finger drumming technique. But, mappings for V-Drums , EZdrummer , Addictive Drums , BFD , and Superior Drummer are also available. Snare bleed lets one adjust the amount of snare wire buzz that is occurring when a tom is hit. This happens naturally because hitting a tom creates air vibrations that are picked up by the snare drum. The snare then also starts vibrating and the resulting buzz sound is then also picked up to a certain extent by the tom microphones. The snare bleed knob lets one adjust the amount of this special effect. The channel outputs section lets one choose whether or not single drum kit pieces shall be sent to separate outputs of the plug-in, in order to separately process them in a DAW. This increases the number of options to shape sounds with external software plug-ins even more. DrumMic’a! is a fantastic, free virtual drum kit! I didn’t have the highest expectations when starting my test, since I knew free plug-ins usually have many limitations. Not so with DrumMic’a!! Many of the advanced features have been included which make this free virtual drum kit very useful for a broad range of musical styles. Besides having recorded this great-sounding drum kit in a highly professionally manner, with all kinds of top-notch Sennheiser and Neumann microphones, programming this plug-in in Kontakt 5 Player was also accomplished extremely well. 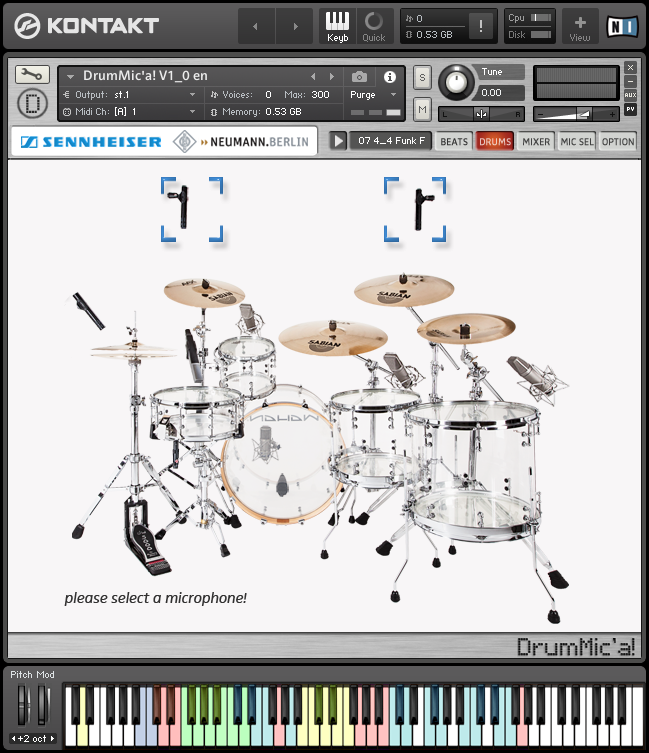 An additional plus for this free virtual drum kit is the option to change microphones on the fly. While playing a drum groove in cycle, one can test different microphone settings and learn how these different microphone (types) shape drum sound. That’s a feature that only very few other virtual drum modules offer. For finger drumming with the XpressPads technique I can highly recommend DrumMic’a!. Download it for free from the Sennheiser website. If you’d like to offer feedback on this free virtual drum kit DrumMic’a! review, use the “comments” section below or the video commenting functions on YouTube or Google+. We’re interested in your thoughts and your experience. If you found this free virtual drum kit DrumMic’a! review and the videos helpful and consider purchasing hardware for finger drumming, we’d appreciate it if you’d use the below Amazon link. It does not cost anything additional, but that action helps us keep up the work that we do in order to bring finger drumming to the people. Many thanks in advance!